Strung with love, this 108 bead Sandalwood mala has two beautiful spotted blue ceramic beads as markers at the 21st spot on each side. They are surrounded by gold Czech glass beads, which also sit around the three holed sandalwood guru bead. One gold glass bead marks the top of the mala. 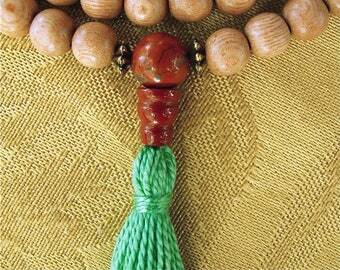 A golden French silk tassel finishes the mala. I string these malas with love and prayer. This mala is made to order and customizable. You can choose to add marker beads, have 108 or 111 beads, whatever suits your needs. Just leave a note during checkout. According to Deity, Mantra, and Wisdom, a Buddhist book about mantras and visualization, sandalwood malas have a magnetizing effect. They are very traditional and meaningful in both Buddhism and Hinduism. Approximately 15 ½ inches or 39.5 centimeters long. 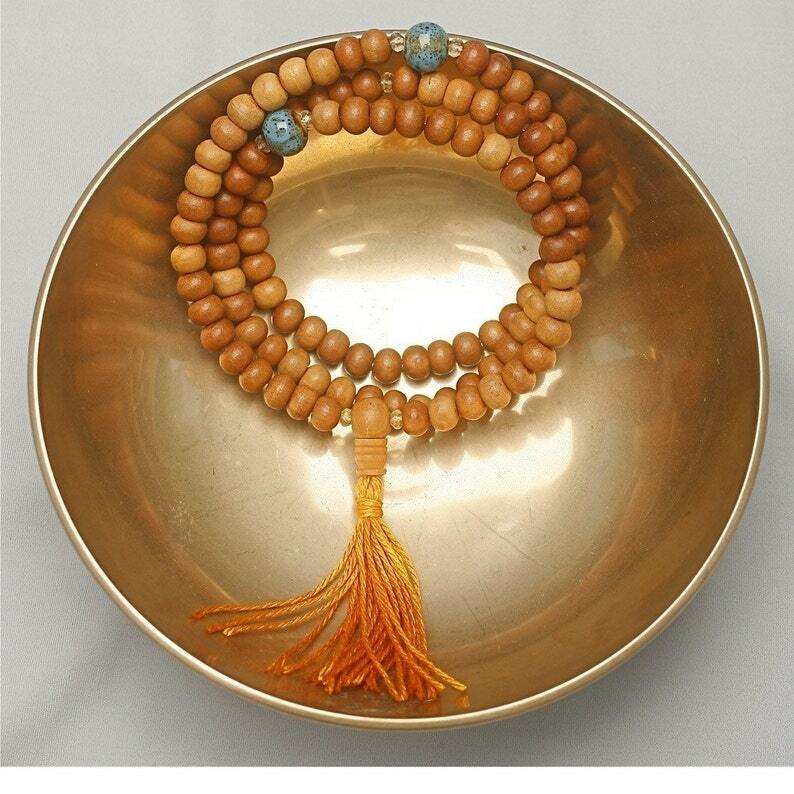 This mala can be worn around the neck or wrist-wrapped gently. I love these Mala beads. They are perfect and exactly what I ordered. Thanks!